Fig Food Adds Creamy Mushroom Soup to its Expanding Range of Certified Organic, Plant-Based Foods - Fig Food Co.
New York, NY – September 12, 2014 – Fig Food Company today announced the addition of new Creamy Mushroom Soup to its growing range of Certified Organic and Kosher plant-based beans and soups, according to Fig Food founder Joel Henry. With a recipe informed by noted early-20th-Century French chef and culinary writer Auguste Escoffier’s “five mother sauces,” Creamy Mushroom was created as a plant-based alternative to traditional cream of mushroom soups; one that contained pieces of mushrooms and could be enjoyed alone or as an ingredient. 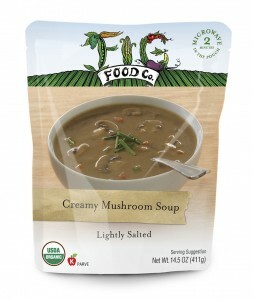 Fig Food Creamy Mushroom contains five grams of protein, no cholesterol and only 280mg salt per serving. — Read the entire news release here. ← Soup, From a Box? It’s Fig Food! And a Giveaway!